I brought my Santa to the front and added his beard on this card. His coat and pants are colored with Smoky Slate (light and dark) Stampin' Blends Markers. 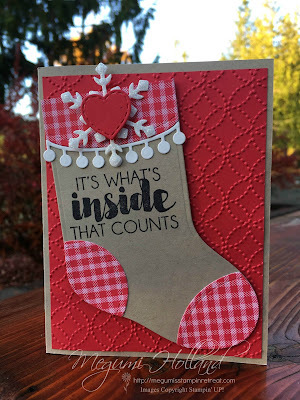 I also colored a small Rhinestone with Cherry Cobbler Stampin' Blends Marker for the mittens. I love the idea of coloring embellishments with any color of Stampin' Blends Markers!!! This Santa's Suit Bundle is one of my favorites in the 2017 Holiday Catalog and am so sad that it's retiring.... There are only a few days left to grab it while supplies last!!! Thank you for stopping by today. Happy New Year!!! 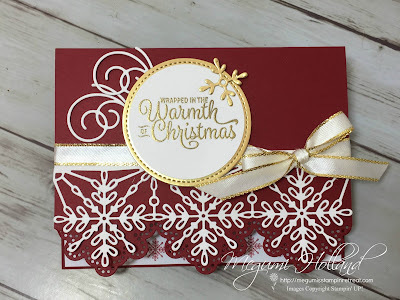 Here is one of the cards we made at my Card Club featuring the Snowflake Sentiments Bundle (Snowflake Sentiments Stamp Set and Swirly Snowflakes Thinlits Dies). Although this bundle will not be available as a bundle after January 3, I am so glad that these products have survived from being retired. Very pretty!!! 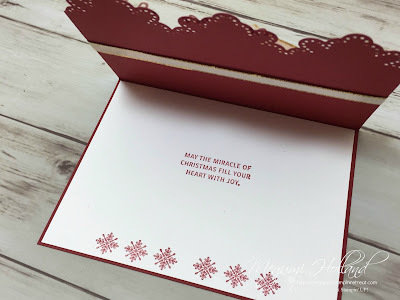 What a nice surprise from Stampin' Up! One last chance to give you an exciting offer before the holidays! We are offering FREE SHIPPING on all orders for 24 hours only. FREE SHIPPING runs from 12:00 am, December 11 to 11:59 pm (MT). Enjoy!!! 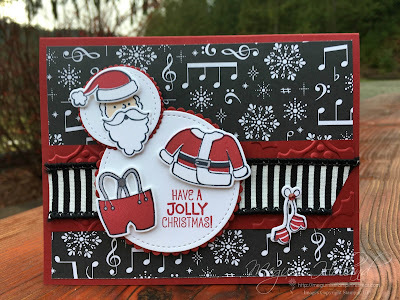 I am having so much fun creating adorable projects with the Santa Suit Bundle (the Santa Suit Stamp Set and the Santa Builders Framelits Dies) and the Winter Wonder Embossing Folder. I was so surprised and sad to see them on the Holiday Catalog retiring list. 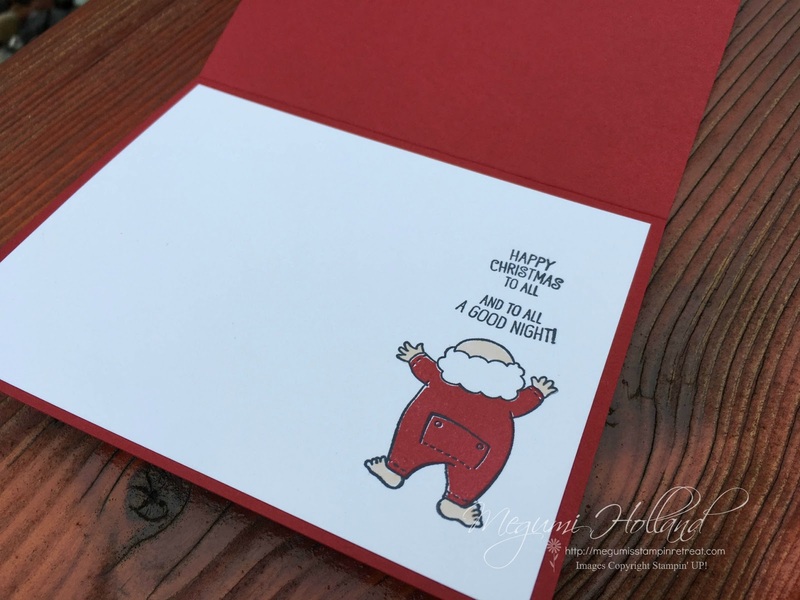 The Santa's Suit Stamp Set comes in photopolymer. The transparent nature of photopolymer stamps makes it easy to line up images for precision placement. To stamp these images I used the Momento Black ink for the outlined images and Cherry Cobbler ink pad for the bold images. 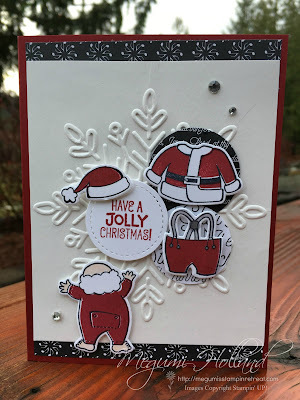 I also used the Ivory Stampin' Blend for Santa and the Smoky Slate Stampin' Blend for the pants. So fun!!! 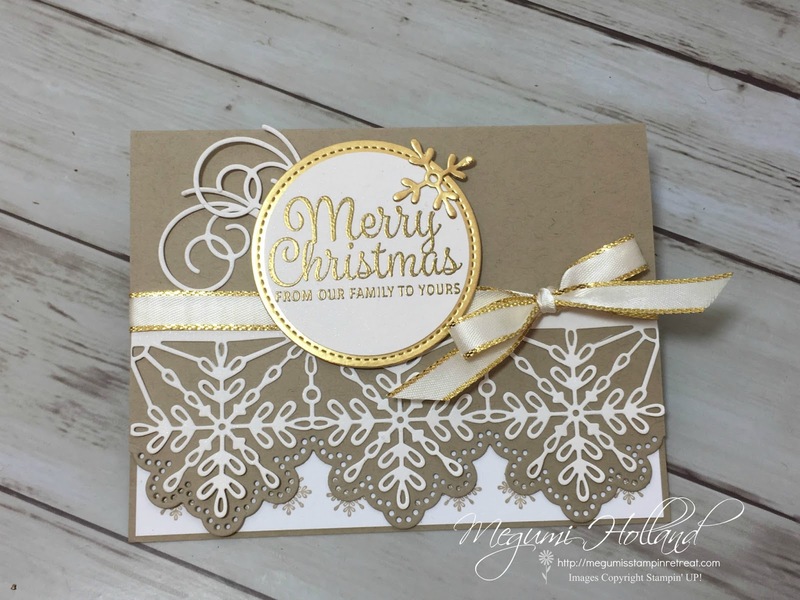 The background Shimmery Paper is embossed with the Winter Wonder Embossing Folder. So pretty! 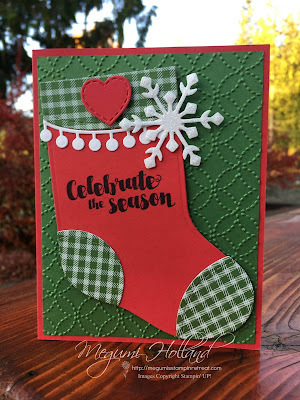 Click HERE to see the Holiday Retiring products at my Online Store. 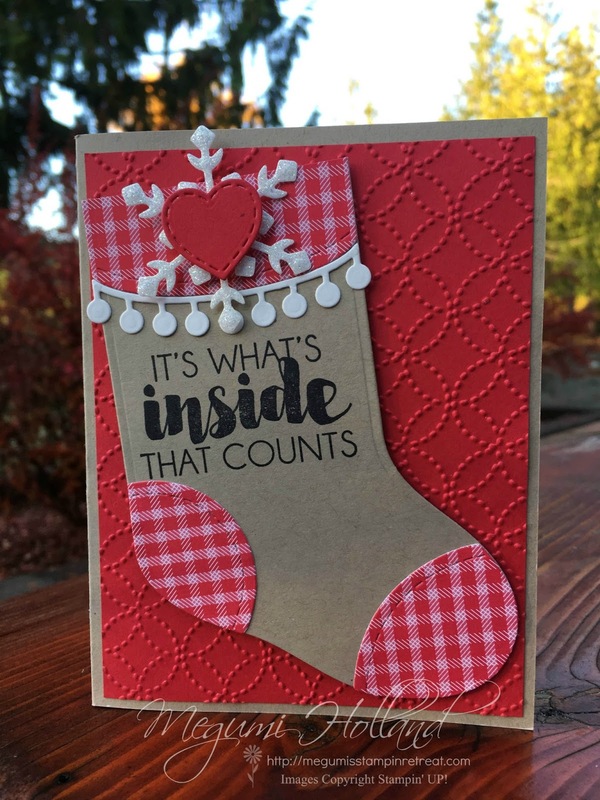 Click HERE to see the Holiday Discounted products at my Online Store. 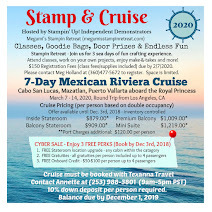 Stamparatus Update - Reserve Yours TODAY!!! The first Stamparatus reservation window reached its maximum number of reservations in just 15 minutes. It was amazingly popular so we have decided to make some important adjustments to the reservation process. The second reservation window will remain open from December 5-30; however, during this reservation period we will take as many orders as we receive and not close the window until December 30, 2017. 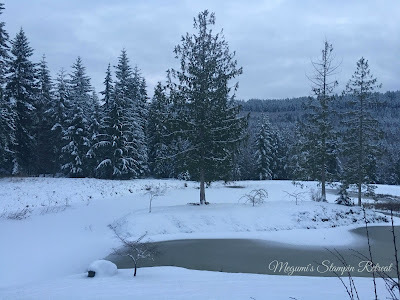 Beginning March 19, we will ship Stamparatuses in the order the reservations were received (first in, first out) and continue through the next few months and beyond as product arrives in our warehouse. Because shipment dates are based on manufacturing lead times, not all of the reservations made during the December 5-30 window will ship on March 19 (as was previously announced). This is the last chance to reserve a Stamparatus before it becomes available in the 2018-2019 annual catalog. The reservation window will open at 2:00 PM (MT) on December 5, 2017. It's that time of the year again! The Holiday Catalog retiring product list has been released along with a Year-End Sale. 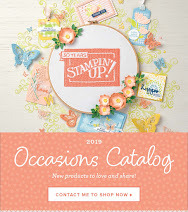 Discounted items may be added to a Starter Kit - or purchased with Stampin' Rewards - at the promotional price. 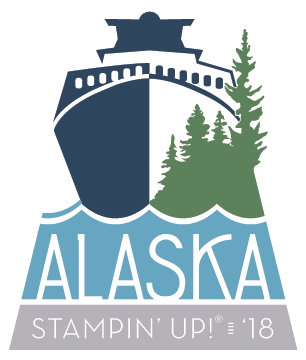 Due to high remand for retiring stamps, we will keep producing retiring stamps until December 21 (not accessories - accessories are only while supplies last). ALL BUNDLES are retiring. A bundle is where you save 10% on those products when purchased together. However, some of the products are NOT retiring. So if you want to save the 10%, order NOW. For instance, the Painted Harvest BUNDLE is retiring. However, both the stamp set and the punch will remain available. 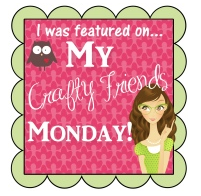 Click HERE to see it all in my Online Store. Or click below to select each category. We have a slightly different schedule than normal during this busy holiday season. Here is a list of my upcoming workshops. If you are local and would like to come to any of these classes, please contact me. Space is limited. I might squeeze in one or two more classes, so stay tuned! Hello Stampers! 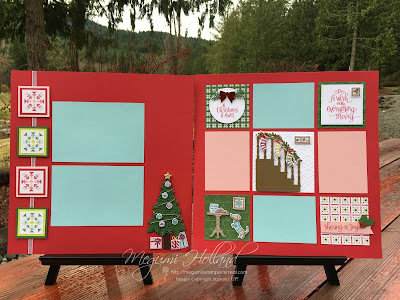 We made these cute scrapbook pages at my Scrapbook Club workshop earlier this month featuring the Ready for Christmas Stamp Set and the Christmas Staircase Thinlits Dies. Stamp the tree image on Garden Green card stock in Garden Green ink and die cut the stamped image. Cut a strip of Early Espresso card stock for a tree trunk and adhere it to the stamped image. Die cut 6 branches using Garden Green card stock. Starting from the bottom adhere one branch onto the stamped image with Fine Tip Glue Pen. Take a piece of Gold Cord and wrap it around the tree. Secure the ends with tape. Decorate the tree with ornaments and a Gold Glimmer star! 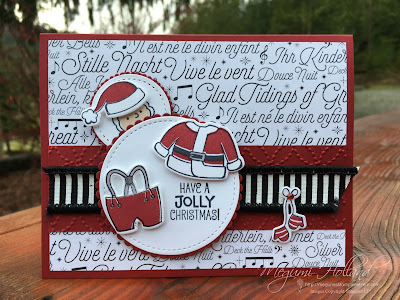 The Ready for Christmas Stamp Set is packed with cute images! 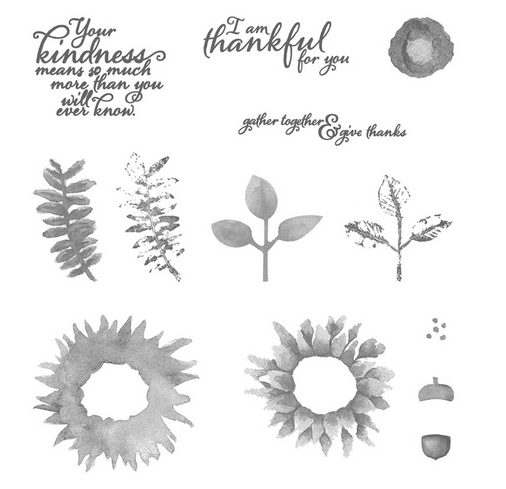 I stamped them in Momento Black ink and colored them with Stampin' Blends. So fun!!! Happy Cyber Monday everyone! Hope you enjoyed our Online Extravaganza Sale last week. I am super excited to tell you we are not quite done yet.... We are offering 24-Hour FREE SHIPPING on all orders TODAY! It's a great time to get those items you have been wanting and save that extra cost of shipping. This doesn't happen often so I hope you can take advantage of it today. FREE SHIPPING runs from November 27th, 12:00 AM to November 27th, 11:59 PM (MT). 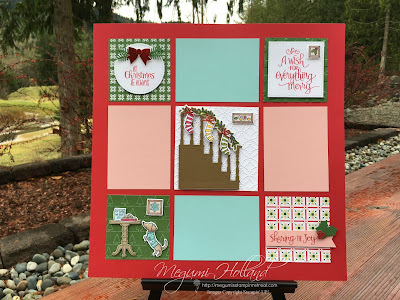 Here is one of the projects we will be making at my Big Shot class this month featuring the Ready for Christmas Bundle. Isn't it so cute? You can go ahead register online now. Please note space is limited and the online registration will automatically close when it's full. RSVP - Please click HERE to register online. You will receive a confirmation via email once your registration is complete. Our annual Online Extravaganza is finally here! 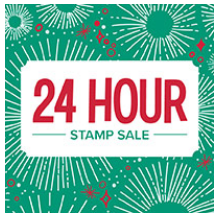 This year we are kicking it off with the 24-HOUR STAMP SALE!!! 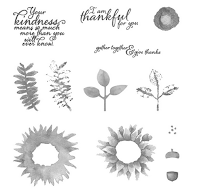 Select stamp sets are 20% off for the first 24 hours of Online Extravaganza. Click HERE to view the 24-Hour Stamp Sale items. I am thrilled to see the 6" x 17" Gusseted Cellophane Bags are 40% off during this promotion. We made this beautiful candle gift set in my Painted Harvest class yesterday. 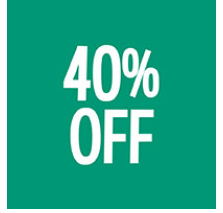 Click HERE to view the 40% off items. 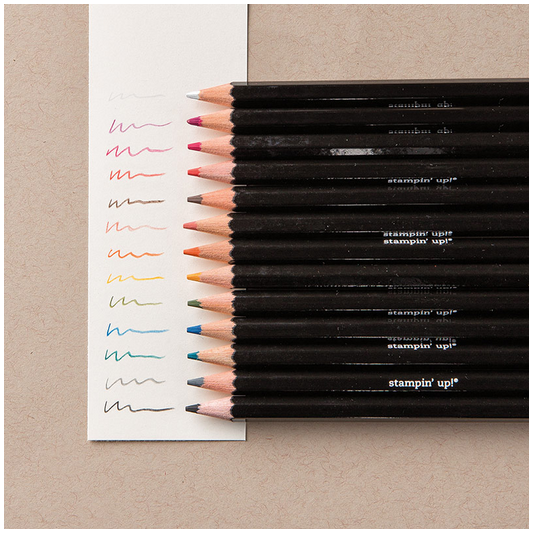 My pick in the 20%-30% off category is definitely the Watercolor Pencils. It's a great time to try them out. 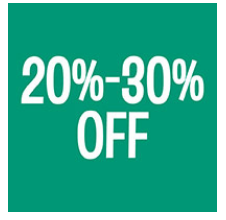 Click HERE to view the 20%-30% off items. 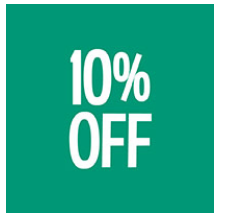 Click HERE to view the 10% off items. Hello Stampers! I am back from the Stampin' Up! OnStage (convention) in Salt Lake City and have a lot to share with you. I am so excited to FINALLY be able to tell you about this brand new product - the STAMPARATUS!!! I have known about it for quite a long time as serving as one of the L2L members but I was sworn to secrecy! In fact, I got to be part of developing this amazing tool. I can't wait to get one and start playing with it!!! 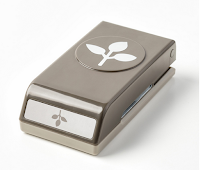 This innovative stamp placement tool will change your stamping life!!! 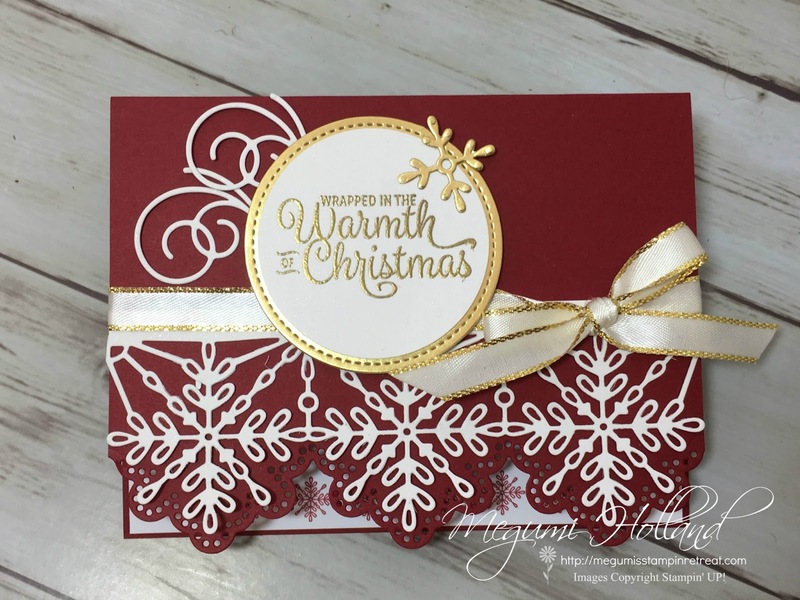 You will fall in love with stamping all over again when you learn everything you can do with it!!! 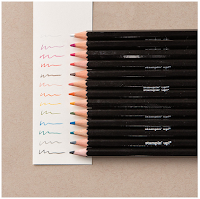 If you want a darker impression, apply more ink and restamp - no need to start over! 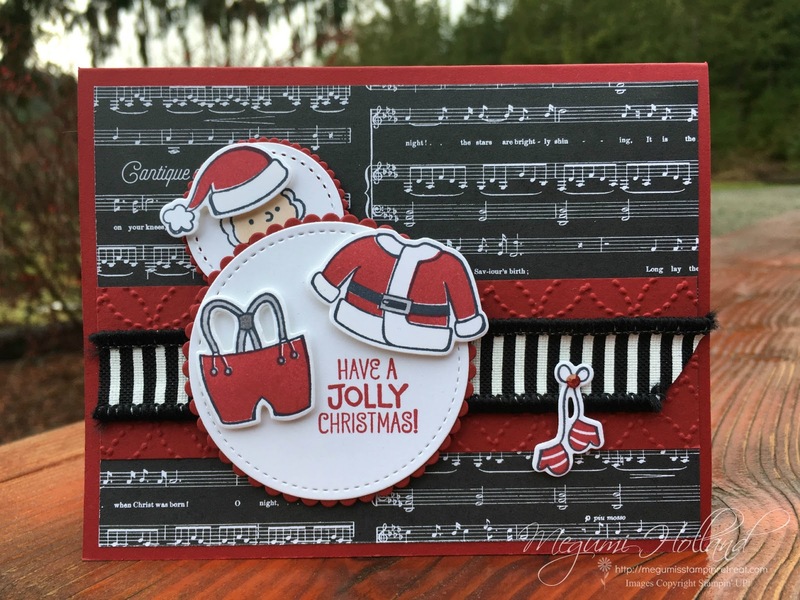 Easily create 2-step, 3-step, and 4-step stamped images using REVERSIBLE plates! This is something new and different. You can be one of the first to get it by RESERVING it. Reservation will begin at 2 pm (MT) on Thursday, November 16th. If you want to cancel, click cancel and your reservation will be removed from the system. To reserve a Stamparatus, you must have a customer account. To create one, click Create Account on the online store. Thank you for stopping by today. I hope you are as super excited as I am about the Stamparatus! Please feel free to contact me with any questions. Have a wonderful day!!! Hello Stampers! I am super excited to offer my Painted Harvest Gift Set Class this holiday season. 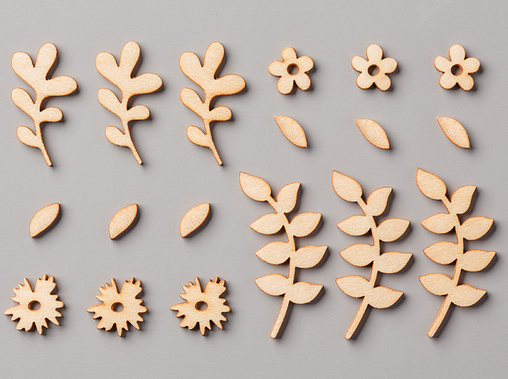 Have you ever wanted to make handmade gifts for your friends, coworkers, and family members? But no time and too much work? 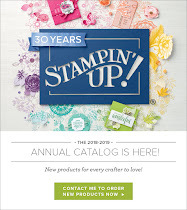 Or you purchased the stamp set but don't know where to start? This is a great opportunity to finally do it!!! Come and learn how to make an assortment of five beautiful handmade cards, decorate an acetate box for your cards and envelopes. You will also learn how to stamp on candles too. 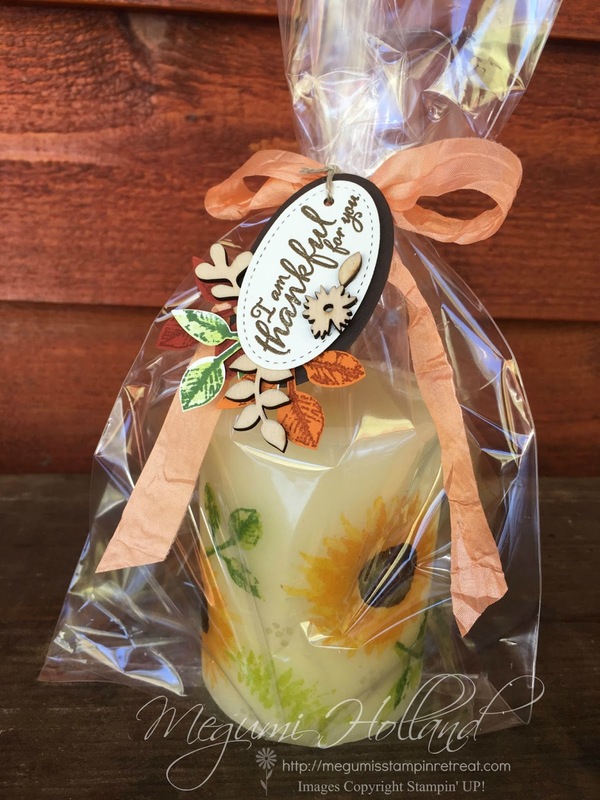 You will receive a 4" Apple Crisp Pillar Candle from Sequim's finest Full Moon Candle Co.! Their candles are amazing!!! Click HERE to visit their website to see their high quality candles. Please note each option includes a package of Touches of Nature Elements. 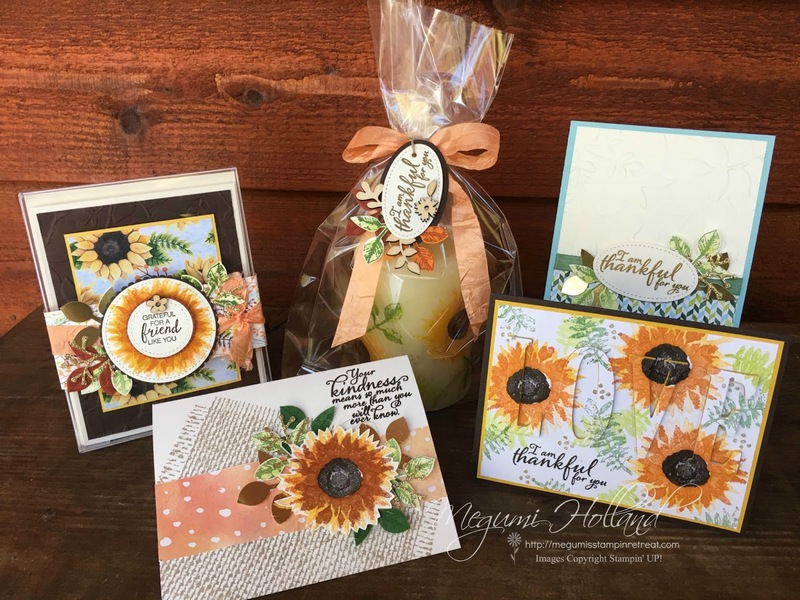 Class Only - $30 (all materials and candle) - select this option only if you already have your own Painted Harvest Stamp Set and Leaf Punch. If you would like to make additional projects at home, I will be happy to provide materials for you. 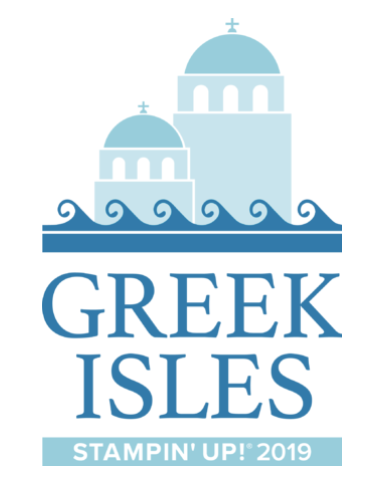 Class Registration - Please register by November 11th. Please note that the online registration will automatically close when it reaches the capacity. Please email me (megumih4stamps@hotmail.com) if you wish to be placed on a wait list or possible another class. Thank you for stopping by today. 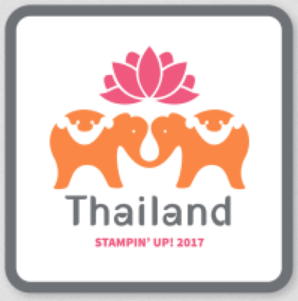 Please feel free to contact me (megumih4stamps@hotmail.com) with any questions. Have a great day!! !